Share the post "A Food Lover’s Delight in Barcelona"
Why do we travel? What’s the intrigue in visiting someplace new? Is it the sights and views, along with the millions of photos and selfies we snap as we wander around? Is it the history of a place, bursting from ancient walls and whispering their secrets to those who pass by? Is it the culture, and the realization that there are so many people out there who think and live in a way much different than your own? Or is it the cuisine, with exotic smells wafting from street vendors and locals chowing down on their favorite comfort foods as you try to ask your waiter for whatever they’re having? Every traveler is unique, and perhaps you have reasons very different from the ones I’ve listed. For me it a is a little bit of all of those things, and if one is missing, a trip just isn’t complete. When I visit a place, I’m all in – I want to explore it with all of my senses. I want to have my breath taken away by the sights, learn something new and interesting, meet new people and understand other perspectives, and taste flavor combinations I would’ve never imagined. However, depending on the length of your stay in a city, it can be difficult to fit all of these things in. Sure, you can do your research before you visit, plan your itinerary, and go to all of the restaurants you found after hours scouring TripAdvisor and Google Maps. But can you really trust it to be an authentic, local experience? Or are you just getting the touristy perspective? I’ve lived in Barcelona for over 4 years, and I’ve taken more tours of the city than I can keep track of. Free walking tours, bike tours, mystery and adventure tours, etc… but my favorite, by far, has to be the foodie tours I’ve taken with Eye on Food Tours. Both of the tours I’ve taken with them have been a perfect combination of sights, history, culture and local cuisine. A bakery we got to visit behind-the-scenes on the morning tour! A few months back, I was invited on their morning tour of El Born and the Gothic Quarter. I was pleasantly surprised to find that we were taken to places I hadn’t yet been, and learned some super interesting facts about the city and foodie culture. I’m not really one for history, but our guide was really enthusiastic and a fantastic story-teller, so I found myself sucked in to the stories of centuries past. One really cool feature of this company is that it is family-run and their passion for the culture here really shines through. They change up their tours every now and then to adapt to the seasons and are constantly adding new and exciting things to their itineraries. So, when I was invited back to try out their new evening tour, I was all in! The tour began at the Barceloneta Metro Station, an easy place to arrive via public transport. We made our introductions (such a small world – we were all California natives!) and then we were off in search of our first location. Our guide, Adrian, gave us a moment to stop at a nearby shop to get a water bottle for our 3.5 hour tasting journey, but it is highly recommended that you plan ahead and bring a bottle with you! And, of course, don’t forget comfy shoes! 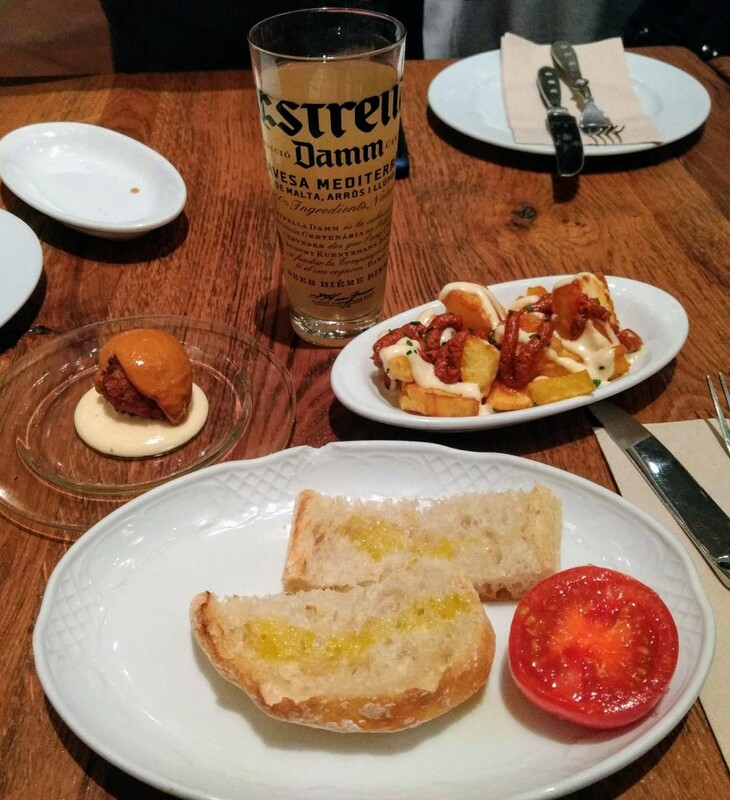 We headed straight to a tapas bar, which you probably couldn’t find if you tried – there’s not even a sign out front! Regardless, the place was packed with locals. If you want an authentic experience, it is right here. We squeezed in past the crowds and found a little nook in the back corner. Our first tapa was jamón serrano (a special Spanish ham) cut into thick slices, paired with a creamy, aged Manchego cheese. Adrian explained to us the difference between jamón serrano and jamón ibérico, two very popular local products that you can find in tons of different dishes across the country. There are differences in the way the pigs are fed and the meat is later aged, but the results of both are incredibly delicious (but quite different in price). One is much better than other if you’re on a budget or hoping to take some back home with you! Adrian recommended that we try the jamón serrano with the Manchego cheese in one big bite, and the flavors were just eyes-roll-back-in-your-head incredible. The jamón serrano was thick and salty in a pleasant way, and contrasted with the creaminess of the Manchego it was just like heaven. And even better, to wash it all down we got to try two types of local wine – a sparkling rosé, and a traditional Cava (a Catalan champagne). The rosé went down super easy, with lovely fruity notes and a hint of sweetness that paired perfectly with the cheese. We paired the Cava with a plate of Spanish chorizo, fried to perfection and oozing with spices and delicious aromas. Adrian recommended that we try it with the house mustard, and we were not disappointed. I loved the combination of a subtle spiciness from the chorizo with the sweet and tangy notes from the mustard. After finishing our bites, we squeezed our way through the crowds and back outside. Adrian led us into the heart of El Born, a trendy neighborhood known for its popular bars, restaurants, and little boutique shops. We arrived to the iconic Santa Maria del Mar Cathedral, and Adrian explained the differences between it and the even more famous Barcelona Cathedral in the Gothic Quarter. He also mentioned some incredibly interesting notes about the architecture, which I hadn’t heard on any tour before – do you know what those little black squares are for on the side of the building? Pa amb tomaquet, Catalan for ‘bread with tomato,’ looks super simple and quite boring until you actually try it. The bread is thin and baked in a special style, helping facilitate the incorporation of the other ingredients. With one half of the tomato, you put it cut-side down on the bread and spread it all over, trying to get all of the juices out until you’re left with just the tough, outer skin (which you discard). Then, you top it with some high quality olive oil and salt, and there you have it! Pa amb tomaquet is a super popular and common appetizer for the Catalan people, and sometimes can even be served as the main course topped with jamón or other local cold meats. Patates Braves are fried cubes of potato topped with a spicy sauce and a type of garlicky mayo called alioli. You can find this dish on pretty much any menu of every bar or restaurant across Barcelona, but they are NOT all made equal. I’ve made the mistake of ordering this before in a touristy restaurant, and was basically served half-cooked potato chunks with ketchup and mayo. Those are NOT Patates Braves! The Patates Braves in this restaurant were, by far, some of the best I have ever tried in all of my time in this beautiful city. The potatoes were cooked to perfection, but that isn’t what made it special – the spicy sauce is made in-house, and the flavors are mouth-wateringly spicy and delicious. Mixed with the creamy alioli, you really can’t go wrong. And last, but definitely not least, we had “la Bomba,” a dish with an interesting history (you’ll have to take the tour to find out about it!). La Bomba is another dish that is quite common to find on menus across the city, but unless you know where to go, I highly recommend not ordering it – I’ve had many a Bomba that brought a grimace to my face. La Bomba is a fried ball made with a puree of potatoes and a center of spicy meat. It is generally topped with a creamy and/or spicy sauce like the Patates Braves. Everyone has a different way of eating it, but my Catalan husband taught me to cut right into it and mix it together with all of the sauces for a delicious mixture of heaven. And this one did not disappoint! The spiciness of the food was quelled by a refreshing “Clara,” a mix of beer and lemon soda. Especially refreshing in the summertime, the Clara is a great way to enjoy a drink without getting too much alcohol in the process. On all of the historically important buildings and businesses in Barcelona, you can find a plaque like this out front. If you see one as you’re wandering around, take a look inside! You’ll probably be pleasantly surprised. This plaque was just outside a specialty store with tons of freshly roasted nuts and sweets, and was decorated special for the holidays. The place was buzzing with people getting their Christmas shopping done, but we were still able to take a look around and get a sample of some delicious, roasted almonds. Adrian showed us into the back to explain this old-fashioned wood oven they use to make the best quality roasted nuts. We left the store and then headed towards the Gothic Quarter, where the historical city center lies. We wandered around the old city walls and then visited the Plaça del Rei, where Adrian explained some of the history regarding Columbus, King Ferdinand and Queen Isabella. As I mentioned before, I’m not really a big history buff, but hearing the stories told in this way was extremely interesting to me! Barcelona is such a fascinating city with a rich history and culture – you’d do yourself a disservice if you didn’t learn a little about it! As we continued along the old city walls and narrow, winding streets, we found ourselves at a little hole-in-the-wall of a Bodega. This is one of the big perks of going on one of these tours – they take you to places you’d never find on your own, or never even think to enter. But the guides here have done their research and hand-selected the best tapas and pintxos in the city! At this bodega, we tried a pincho called a “Gilda,” a specialty originating from the Basque region that is quite popular across the country. If you’re a fan of the cinema, you’ll be very interested in learning how this dish got its name! There are variations of this pincho, but the classic has high-quality green olives, anchovies, and vinegary guindilla peppers. The combination boasts strong flavors that blend together perfectly, especially when washed down with vermut – my absolute favorite local drink! Vermut is a sweet wine infused with spices, and is quite common to find in bars and restaurants across Catalunya. It is definitely not for everyone due to its strong flavor (and decently high alcohol content), but it is worth a try! You can drink it plain over ice, or with club soda served in fun little dispensers right on your table. In addition to the Gilda, we got to try two more unforgettable specialties: the Spanish “tortilla” (no, it isn’t what you make tacos with) and croquetas. A “tortilla” across Spain is a simple dish made with eggs and sometimes potatoes and/or onions. It is basically a thick omelette without any stuffing, but when done correctly, the simplicity of the dish renders it undeniably delicious. In this bodega, they served it to us with some alioli and Adrian recommended we try the tortilla bites smothered in it – not disappointed! Croquetas are Spanish comfort food, without a doubt. They are fried balls (similar to la “bomba”) stuffed with various ingredients, the most popular of which is jamón. Here, we got to choose between 3-4 different options, and we all opted for the squid in its own black ink. When I first arrived to Barcelona, I might not have been that brave, but since then I have learned that you absolutely can NOT pass it up – just don’t think about what it is! The croquetas were served in a yummy olive oil infused with herbs and topped with thick sea salt. The combination of all of the flavors was heavenly – I highly recommend trying it! Although I’m sure the other options are just as tasty. We were also led to the Plaça Sant Jaume, which houses some beautiful and important government buildings. We got lucky once again (love the holiday season!) because there was a variation of the Nativity Scene out on display. Every year they change it up, and it was actually my first time ever seeing it. Adrian, our guide, graciously gave us some time to take a look around, although it was quite packed with people. From there, it was time to go to our last stop – a local’s bar which specializes in (and, in fact, only offers) 5 types of tapas. We got to try out three of them: an incredibly fresh tomato salad, butifarra and “pescaditos fritos” (small, fried fish – and they’re fried whole, head and all!). Butifarra is a typical Catalan sausage with spices, and it was served over Pa amb tomaquet. As for the ‘pescaditos,’ I had tried them once before, many years ago, but I was still hesitant to try them this time around. Some people just pop them in their mouth and eat them whole, and others (like myself) prefer to remove the head and nibble around the small spine (which you can’t even really taste if you have the confidence to eat it whole). When we went, the entire place was packed and we had to make due with a small portion of the bar, standing. But hey, you want a taste of the authentic Barcelona, this is the way to do it! And what better way to finish the tour than with a fun, local tradition – drinking wine out of a “porrón,” a glass container with a spout. It is quite tricky and requires a bit of hand-eye coordination, but do not pass up on your opportunity! Just be sure to protect your clothes while you do it. And with that, Adrian led us to a nearby street which was just a few blocks away from where we had started the tour. We said our goodbyes, and he offered help and recommendations on the best way to get back to our accommodations. The tour was quite fun, full of excitement and delicious cuisine, but I was still sad to have it end! If you’re visiting Barcelona anytime soon, do not hesitate to try any of Eye on Food Tours’ offerings! They change up their tours all of the time, and add new ones as well! You will not find a tour company with more passion for what they do, and your taste buds will thank you for it. Which of the tapas are you most interested in trying? Have you ever taken a food tour before? If so, what was your favorite dish or historical tidbit?